Teachers have a critical ally in Santoro, who argues that understanding demoralization is the first step to reclaiming the vitality of teaching. Today’s teachers are not burnt out; they are separated from their moral motivations—to the detriment of their students and the impoverishment of the profession. Doris Santoro has provided a timely and vital educational intervention. She demonstrates how today’s ‘accountability’ regime undermines the work of dedicated teachers and offers sensible strategies for reversing the damage. Demoralized is imaginatively framed, convincingly argued, and morally serious. I commend it to all who care about teaching and teachers. 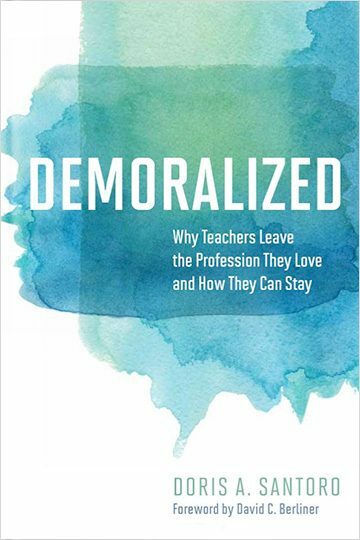 The stories and resources in Demoralized will resonate with teachers as our profession remains under siege. The teachers featured in this book will inspire and empower readers.